After reading the first book in this season I was eagerly awaiting this one, it’s strange how waiting a week for the next episode can seem so long while for some books you have wait years. So I was happy when I finally got the chance to dive into Specter. 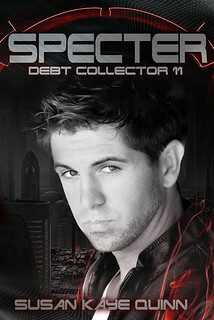 Specter is short and sweet and still contains so much story. The mysterious organization about which was hinted in Wraith is expanded on in this episode, combined with the other story threads about Wraith like her mercy hits and the company she’s part of. While we learn more about the mysterious organization, it stays mysterious and I think I have more questions then when I started this book, but I am also intrigued and the next episode seems too far away. I really admire how Susan can write this episodic format and puts enough story in each books, not end it with a cliffhanger, but still makes you hunger for the next book. Now that’s what I call great writing. There’s an interesting development between Wraith and Wyatt in this book and I wish we got more. The scenes seemed to short and I just wanted there to be more, but it also made sense for Wraith ton react this way. To conclude: While Specter was a short episode, it’s full of story. I liked learning new things and adding even more questions to my list. There’s a hint of romance, but it isn’t explored a lot yet. I can’t wait for the next episode! You’re really making me want to pick up season one of this serial! How many episodes are in season 2? Maybe I’ll wait until it’s finished so I won’t be dangling too much LOL! I think season 2 will have 9 episodes, just like season 1. So they will go till episode 18 when both seasons are released. The first season doesn’t end with a cliffhanger, in fact season 2 feels like a totally different story, but set in the same world. They will be connected in the final season 5. So I would recommend to just start season 1 now ;).